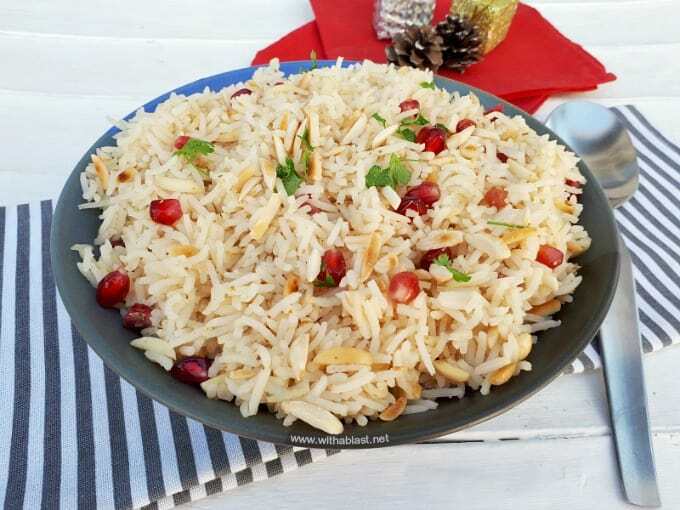 A Quick and easy recipe for Pomegranate Almond Rice a.k.a. Christmas Rice – perfect to serve as a side to any main Festive meal, which might just steal the show ! Looking for a new side dish, specifically a rice side dish, recipe to serve with your Christmas roast ? 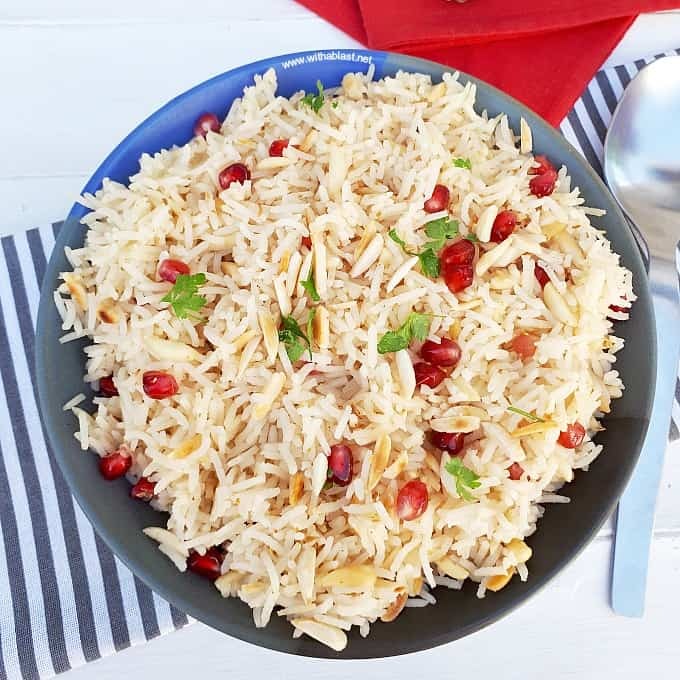 I have you covered with this delicious Pomegranate Almond Rice recipe ! The rice does not only look Festive but actually tastes like Christmas as well, if you know what I mean. Almonds always adds a nice flavor and crunch to a rice dish. Add Pomegranate seeds, a bit of Lemon juice for zesty-ness, and you have a winner, which might just become a favorite side dish for years to come. Normally, I miss out on Pomegranate seeds, or the whole fruit for that matter. But this year we finished all our holiday shopping, including groceries, during the first week of December. And, unlucky me, usually wait too long to get to the stores to grab some limited edition sweets, treats and seasonal fruits. Pomegranates are always one I miss, but not this year ! As soon as I noticed them in the vegetable section at the supermarket, I grabbed a couple of tubs. The seeds are not only delicious in various recipes like this Pomegranate Almond Rice but also in drinks. Have a peek at my Christmas Cocktail as well. Besides using the Pomegranate seeds in recipes, I also love, love to snack on them ! My family prefers them in a recipe, especially this rice dish which is also know in our house as Christmas Rice. Soo, the snacking part is just for me ! Straight out of the tub, as is. My kids have always loved this rice dish and would choose it over any other rice any time of the year. Festive season or not. 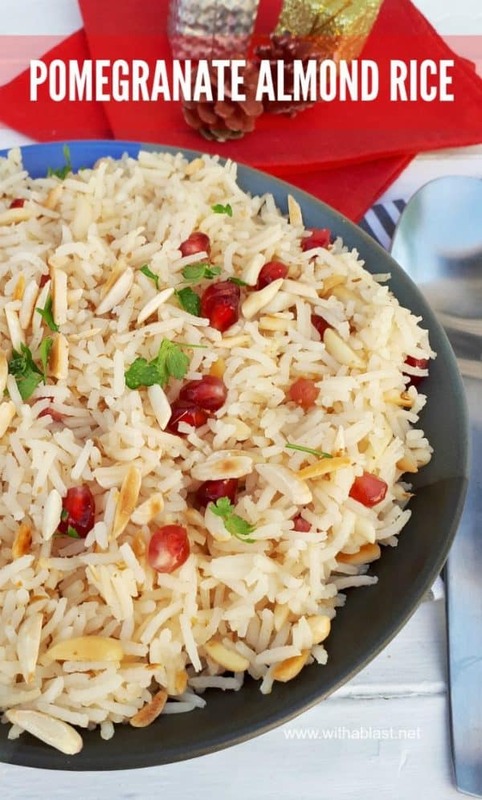 Nutty with a bit of zest, a little sweetness from the Pomegranate seeds, and above all the crunchy texture, makes everything just work in this rice dish. The recipe is so quick and easy to make. It is basically rice cooked in vegetable stock for that extra bit of flavor, and once the rice is cooked, it gets all tossed together with the remaining ingredients. Easy, right ? And if you are cooking for a crowd, all the ingredients can easily be doubled or tripled. Even more if need be, but I will leave you to work that one out. Need to take a side dish to a potluck ? This Pomegranate Almond Rice is absolutely perfect. And you will see just how popular the rice is by the speed it disappears. 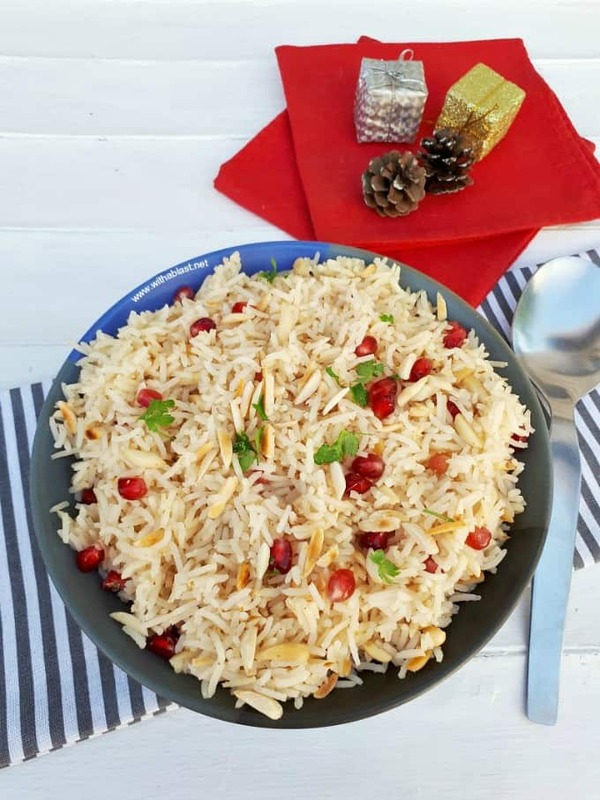 A Quick and easy recipe for Pomegranate Almond Rice - perfect to serve as a side to any main Festive meal, which might just steal the show ! 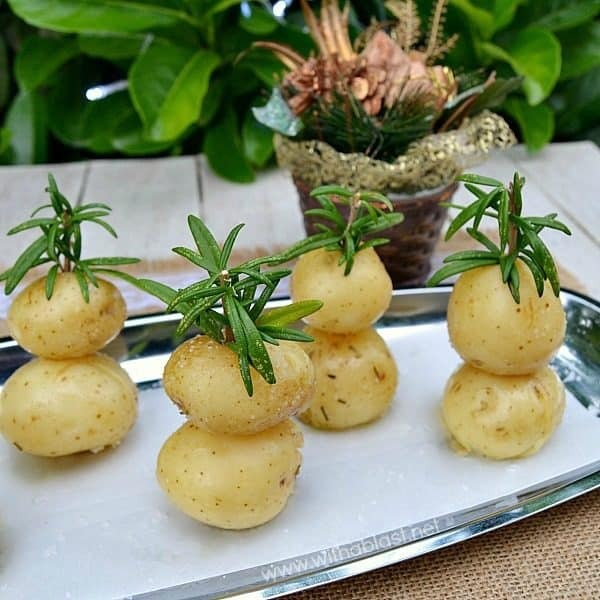 I’m always looking for easy recipes for the holidays and this one is perfect! Love the addition of pomegranate seeds too! So pretty, I bet it tastes amazing too!